KYA put us up in style at the Sheraton for the next four weeks. Clare and I went house hunting and found a beautiful stone home on Geldert Drive in Tiburon, overlooking the Golden Gate Bridge, one of three homes designed by French architect Anthony Dinola. Down the street was the dock, so I could take the ferry to work. The price was $50,000. Joel Chaseman had delivered on his promise to get my contract buyout money. His check for $20,000 went toward our down payment on the new digs. Joel went on to become president of Post-Newsweek and is now retired. He lives not far from my Kensington home and we often get together for lunch. The Hollidays can thank Joel for that wonderful home in Marin County, a home I often wish we still owned. Four years ago I was in Sacramento with the University of Maryland playing in the NCAA Tournament when I took a nostalgic visit to see the old Tiburon house. While I parked in front of the house reminiscing, the owner came out and asked if he could help me. After I identified myself he invited me in for a drink. It turned out that he was the fellow who had bought the house from us. "I don't recall you, but I do recall the lady," the owner said. "She had two little girls and an English pug." He was right. I was in Washington, D.C., when Clare closed the deal. As we talked, I noticed Clare's original curtains were still up in the rooms 25 years later. The owner casually mentioned that we gave him a good deal on the house. He recalled paying us $69,000. I asked him what it was worth today. "One point two million," he replied. KYA was the "Boss of the Bay" and yours truly became the "Baron of the Bay." The small studio, high above Nob Hill at Pine and Mason, was nested in the rear of the elegant Hotel Mark Hopkins. Clint Churchill was in his mid-30s, not much older than his staff. With "The Boss" emblazoned on the back of his basketball jersey, Clint was involved in everything at KYA. We'd even see him in the station late at night splicing tape — uncommon behavior for a station owner. He lived and loved radio. Clint hired me for the 2:00 to 6:00 afternoon shift. The KYA team was Tommy Saunders, Jim Washburne, Gene Nelson, and Russ "The Moose" Syracuse. My KYA starting salary was $27,000 a year, the same salary I had going in New York. My base salary had more than doubled from the $11,600 I earned at WHK. This wasn't bad. When you add in the promotional fees and commercial revenues, I was earning $44,000 in just my first year at New York, a boatload of money back then. For the record, I have never had an agent. Clare has been the only financial planner in my life. At KYA, I continued to get even more heavily involved in commercial work. Tower Records started in San Francisco, and I did their very first spots. KYA was involved with whatever was happening musically in the city. We sponsored shows at the Cow Palace and other local venues. 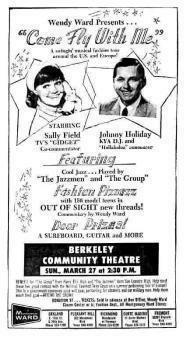 One of the first big shows I emceed featured the Rolling Stones, the Byrds, the Beau Brummels, Paul Revere and the Raiders, and the Vejtables, at the Civic Auditorium on May 14, 1965. I think "Satisfaction" by the Stones had just been released. "Captain" Bill Stauch, of Walnut Creek, Calif., became my traffic reporter. Bill had a regular non-radio job. He'd drive through the Caldecott Tunnel in Oakland every morning and phone in his "tunnel report" when he got to his office. Capt. Bill's "exclusive tunnel reports" were mostly the same each day: "Well, things are pretty good this morning. No apparent tie-ups." Sadly, Bill died in January 2002. Bill and his wife, Patti, became two of our closest friends in the Bay Area. I took off once on the weekend with the "KYA Air Force." This was one small airplane that we landed at different airports around the Bay area and invited listeners to meet us for prizes. I'd hop out of the plane in a baseball cap and a red scarf around my neck, meet the fans, give out a few records, hop back in the plane, and off to the wild blue yonder I'd go. Some of those flights in windy San Francisco were uneasy at best. Really rockin' and rollin'! The most sweeping promotion I ever did at KYA was a Principal of the Year election where kids voted for their favorite school leader. The winning principal would receive a $1,000 wardrobe and a free concert at their campus featuring The Lettermen and a young, unknown Neil Diamond. I knew Neil from New York before he hit. As a favor, he once purchased a pair of Beatle Boots for me in Manhattan and brought them with him on a flight to San Francisco so I could wear them when I hosted a Beatles concert. The principal contest went right through the roof. Since there were no entry restrictions, the winning all-girl Catholic high school duplicated votes around the clock and delivered over nine million votes for their principal. Clint commented that "We knew the contest was serious when they began to bring the votes down in trucks."